Home › Uncategorized › How to Survive Valentine’s Day as a Single: Who loves you? How to Survive Valentine’s Day as a Single: Who loves you? Think about who loves you in your life? My relationship advice is even though you are not in a serious relationship this year to consider your family members- your parents, your grandparents if they are around, Aunts and Uncles, Cousins, Nieces and Nephews. How can you make Valentine’s Day a way to celebrate that love? How about making a family member dinner or taking them to dinner? They will surely appreciate the thought and the attention- especially if you have an elderly relative. Perhaps there those who you haven’t been able to spend much time with and you would like to. Then there are the children. If you have kids then spending time with them making cupcakes and drawing hearts. Perhaps you can baby sit for your sibling so they can have a romantic night out and you get to play with your nieces and nephews. The key is to show love and you will get love in return. You can take them for a treat- such as an ice cream sundae. If you have a pet, I am sure there is a strong bond there. I use to say when I was single, that my cat was my longest relationship outside family and long time friends! How about showing them some special attention? They have all sorts of fun treats for dogs now. Your pet gives you unconditional love. So how can you make Valentine’s Day a day to show your love and attention to your love ones? Most everyone would appreciate the effort. So who can you show some extra TLC to this Valentine’s Day? Who would appreciate spending time with you? This inquiring relationship coach wants to know! I’d love to hear your comments. P.S. Get your relationship questions answered and helpful dating and relationship advice! 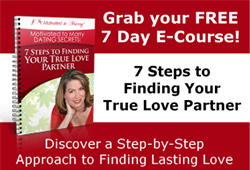 Join my February (2/24) 2009 tele-coaching group to help move you forward towards your goal of meeting a partner for a committed love relationship with the support of other singles, as well. We will work on your online dating strategy. For more information visit www.GetLoveRight.com. Save $200 by signing up by 2/21/09!